For years we have been growing radicchio for our veg boxes, trying to convert more customers to this vibrant winter leaf. Italians are crazy about its bold, bitter flavour: raw in salads, or griddled or roasted until mellow, radicchio has the potential to revive a palate jaded by stodgy cold-weather cooking. Cut the heads into quarters lengthways, cut out the core, then slice into ribbons. Glorious in salads where its bitterness is balanced by sweet and creamy flavours – think pear, walnut and blue cheese with balsamic vinaigrette. Cooking softens its bitterness considerably – wilt into a risotto, an omelette, a frittata. Or make a creamy pasta sauce with salty bacon and a few fried mushrooms. Grilled radicchio is beautifully tender – just right served bubbling in a creamy, cheesy sauce. Radicchio should keep well in the fridge as a whole head for at least a week, possibly two. If you’re using it in several sittings, peel off the outer leaves first, rather than cutting it in half. Fresh from the fields, so wash well before use. 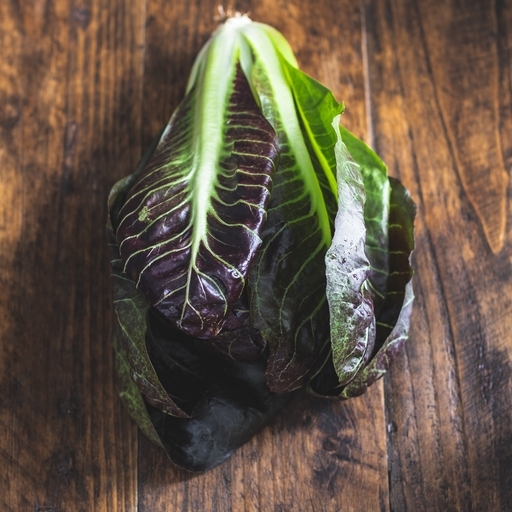 Radicchio looks like a pretty lettuce, but is more closely related to dandelion. It has a good frost tolerance, allowing it to be grown into late autumn. Italians are crazy about radicchio: different regions grow specific varieties for various dishes. We love these tall, cos shaped radicchio known as Treviso.